For some, the “comedy” in Shakespeare’s comedies often seems arcane. Either it’s wrapped up in linguistic mystery or it relies too heavily on puerility. To their credit, The Globe does well at making people aware that a joke is a joke, but even then it’s usually the technocratic middle class, the bearded men in long shorts and transition lens spectacles, who are the ones laughing. 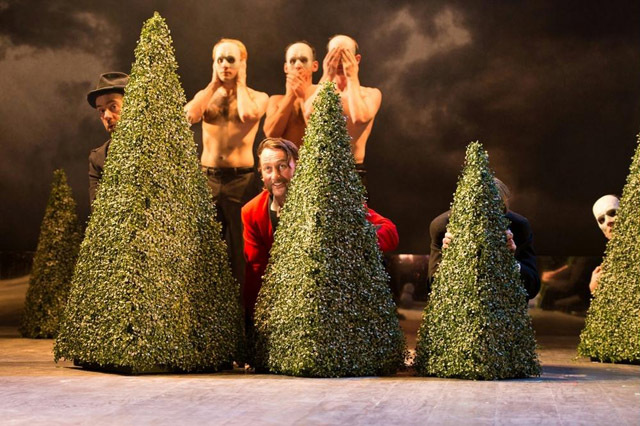 This is why Edward Hall’s revival of his 2006-07 touring production of Twelfth Night at the Hampstead Theatre is all the more refreshing. It is a darkly magical production which delights in all the ambiguities of the text. 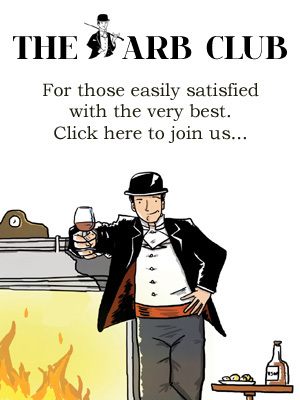 And its humour, is neither esoteric nor mundanely populist, but subtle and intelligent. The all-male cast, who are a brilliant ensemble, enhances the gender-bending at play. Often, in mixed cast productions the gender reversal in Shakespeare’s comedies isn’t all that funny. The reason being that a woman pretending to be a man is only pretending to be something that they’re not. A man pretending to be a woman pretending to be a man, however, is funny. Indeed, this theatrical self-awareness, the “metatheatre”, is so key to Shakespeare’s comedies which often rest upon the fine distinction between reality and pretence. “Are you a comedian?” Olivia asks Cesario, “No… and yet…I am not that I play” Cesario replies. The cast is fully aware of this and revel in the text’s ambiguities and confusion. Not only do they use their transvestism to full effect, their performances subtly highlight the distinction between the reality of the theatre and the play onstage. Ben Allen’s Olivia is particularly impressive. He gives a performance which is both overtly theatrical yet truthful. In so doing he captures the essence of the play’s precipitous deceit. Gary Shelford’s Maria is also very entertaining. Having said that it is unfair to mark out any of the performances for particular merit as this is an ensemble piece, and it is through the ensemble that this production reaches its best moments. The chorus of silent, masked musicians add an eerie, unsettling comedy to the play. On the one hand they are uproariously mischievous in farcical scenes, including a very funny staging of Malvolio’s soliloquy. While on the other they emerge from the shadows when emotions run fraught creating a dark tension to the play. This darkness is a recurring motif in the production. Feste the fool is crucial in the creation of the dark tone, and Liam O’Brien plays him with a wonderfully enigmatic melancholy. The set design and music also darken the tone of the production creating a ghostly space for the chorus to inhabit. The overall effect of all this is to delicately darken the mood of even the funniest of scenes. This in turn underpins why this production is so good: its awareness and exploitation of the ambiguities in Shakespeare’s text. Often we don’t know whether we’re laughing or we’re shocked. Yet this is exactly what Shakespeare intended. Fundamentally Twelfth Night is concerned with ambiguity; that of love, of humour, and of reality, hence why its alternative title is ‘What You Will’. Propeller Theatre’s production reflects all these concerns, and on top of that it’s one of the funniest Shakespeare productions I’ve seen in a long time. 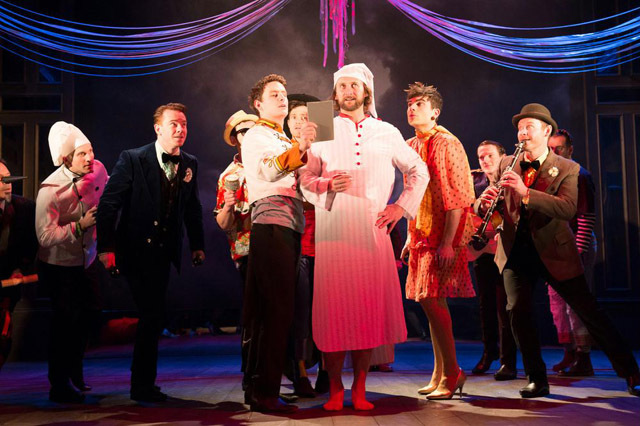 Propeller: Twelfth Night at Hampstead Theatre until 20th July 2013. Tickets £14.50-£29. For more information and tickets visit the website.